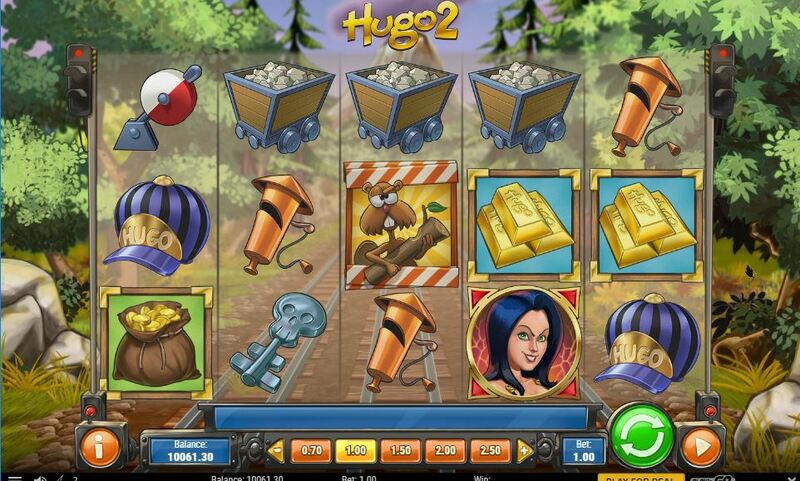 Hugo 2 slot is the sequel to the original 2016 game Hugo, who happens to be a cartoon TV character that was for some inexplicable reason highly popular in Denmark and Scandinavia. Following on from the previous release of Hugo, Play'n Go have improved the graphics quite considerably with a 3D effect of transparent reels over a railway track leading through the forest to the troll's cave which also featured in the original. When opening the game you still get the little blighter greeting you by tapping on the glass and uttering a few inanities and of course are assailed with the jaunty cartoon music as you play. Hugo 2 does have some big rewards available in his little land though, so how likely is he to bestow these upon our bankroll? You cannot argue with the quality of the animations and graphics here though, the most valuable of which is Hugo himself on this 10-line game of 5 reels and 3 rows. He is the Wild and appears on all reels, singly as are the other symbols and pays 50x stake for a 5-of-a-kind win. Diamonds award 35x, Gold Sacks 25x, Gold Bars 20x, Skull Keys 10x with the Mine Cart or Huge Baseball Cap 7.5x and finally the Signal Lever and Whistle 5x for the full line. The Hugo 2 slot promises a maximum possible win of 5000x bet though, along with many other recent Play'n Go slots such as Moon Princess and Viking Runecraft so this great wealth must lie in one of the two features Hugo 2 can offer us. If you see the smiling Afskylia on 3 or more reels you will trigger the Skull Cavern bonus, with one life for 3, 2 lives for 4 or 3 lives for all 5 reels. You will see 3 rows of teetering rock columns in the cave which hopefully spell the end for Hugo due to perils like a rock landing on his head or a swarm of Bats knocking him into the abyss. Should you get him across to the Skull Cavern you select from 3 keys to unlock the chest. You will either be crushed by the lid or a Skull appears and kills him but if you find the treasure, this could be substantial and you can get up to a 5x multiplier on the amount therefore this is where you could carry off that huge 5000x prize! Seeing the Beaver scatter on reels 1,3, and 5 will award 10 free spins known as the 'Troll Race'. Your reels will now be on a train travelling into the screen along the railway line towards Skull Cave and by dodging the Troll as you travel along the 3 lines you collect Wilds and Coins. If you get 4 coins there will be 4 of a 2x multiplier thrown onto the grid and these will affect any winning combination they land on. Collect 4 Wilds and these are thrown onto the grid too in random positions and can sometimes trigger at the same time as the coins if you collect the fourth tokens together. After 10 spins the Beaver may remove the barrier across the track and allow you to carry on for another 5 spins, otherwise Hugo is splattered on the front of the locomotive, haha. There is a more important point to this rail journey though; the Beaver may allow a second 5 extra free spins and should he do so, you will then reach the Skull Cave instead of via the trigger described above. This time you will be give the maximum 3 lives though to take on the obstacles, and have a better chance of seeing those riches!